K Day Beach BBQ 1! 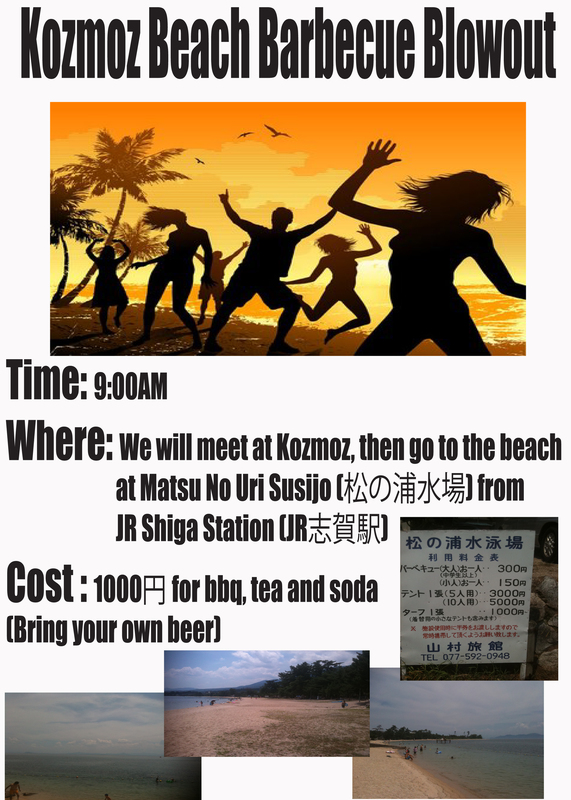 This year instead of our yearly onsen camp out, we will be on the sunny shores of lake biwa for one day BBQ! Actually 2 days, Aug. 14th and 20th. Gonna be a quick walk from shiga station on the kosei line… thats the opposite side of the lake from Hikone for all of you that have made that mistake as I have ; ) Be meeting at Kozmoz Momoyama Center at 9:00 am and on the kosei line platform at Kyoto JR station for a 10:00 departure. Drop a line if you have any questions. Of course there will be a mountain of Papa Bears favorite vittles for the measly cost of 1000 yen to power you up for swimming n games! Want beer? Gonna have to bring your own or there is a beach front cafe that sells small mugs for 500 yen. Dont miss the fun, RSVP today so we know how much of the NOT RADIATED AUSSIE BEEF N BRAZILLIAN CHICKEN N SAUSAGES to prepare!